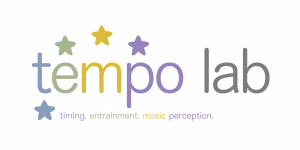 At the TEMPO lab, here at the University of Toronto Scarborough, we investigate the science behind how and why infants and children respond to music, song, and dance. We are especially interested in studying the timing, entrainment, music, and perception in infants and children. Some of our current projects ask questions about how our brains track musical rhythms, how and when babies start to move to music, and the social and emotional effects of music across development. Our studies typically last 30-60 minutes, and involve one or two visits to the lab. We run studies with 6-month-old babies up to 10-year-old children.